2 BR+M Ap on High Floor At Icon 1/ 75k ! 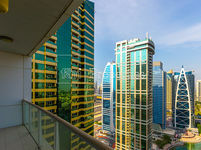 2br apartment available for rent in JLT. Looking to stay in Dubai? It’s always to consider checking the available apartments for rent in Jumeirah Lake Towers project. The standing residential towers on the shore of the three artificial lakes of Jumeirah Al Mas West, Al Mas East, and JLT Lake feature a massive selection of apartments varying in all specifications. They form also a distinctive skyline unrivalled in the whole region. Each of the 80 towers in Jumeirah Lake Towers has a unique architecture style in addition to fancy interior and exterior designs. The towers have also a set of facilities and amenities to make life truly enjoyable for the residents like swimming pools, saunas, steam baths, retail spaces, spas, and many other. Jumeirah Lake Towers is one of the largest real estate developments located in Dubai developed by Dubai Multi Commodities Center. Over a total area of 1 square kilometer, the project comprises 80 high rise towers varying in height between 35 and 45 floors. The highest tower in the cluster is Al Mas Tower which is 66 floors. It’s the only tower over the height range. Towers in Jumeirah Lake Towers project is arranged in 26 clusters, each one has three towers. It’s not only residential towers, there are also hotels like Movenpick Hotel & Residence in cluster A and commercial towers like Al Mazaya Business Tower. 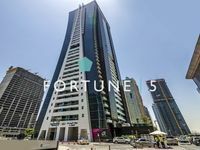 JLT or Jumeirah Lake Tower lies in a central location in Dubai in a close proximity to many of the city’s top recreational and business destinations. It has many facilities also varying between healthcare centers, fire centers, education institutions, and other. Life is extremely fancier in JLT thanks to the available amenities also and retail centers scattered throughout the project. 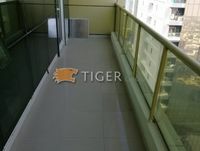 The available apartments vary in type between studio apartments, regular apartments, hotel apartments, and penthouses. They vary in size also, they range from one-bedroom to five-bedroom apartments. The residential units available range between furnished, unfurnished, and semi furnished units. The apartments are well suited for singles, couples, and families. The central location of Jumeirah Lake Tower near the hotspots like Dubai Mall, Ibn Battuta Mall, Burj Khalifa, and Mall of the Emirates, make it very favorable for all residents looking for renting an apartment in Dubai. It’s the true essence of exquisite style of living available for all. The project has access also to integral roads and public transportation networks in Dubai. The only hard part in finding an apartment to rent in Jumeirah Lake Towers is choosing between the plethora of listed apartments available. All towers share similar specifications, the landlords seek to make tenants happy by offering maintenance services in addition to furniture. However, furnished apartments are bit higher in price than unfurnished ones. At the end, it’s up to the tenant to choose according to his tendencies and financial capabilities. Just Property has it all, various types of apartments attached with images and all needed details in order to make it easier for residents to find what they are looking for. It’s way easier than before, just browse the listed apartments and check for the vendor’s contact details, they are available for all users.